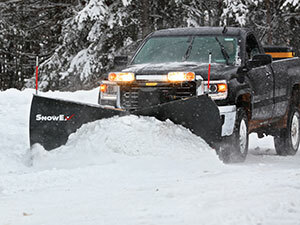 SnowEx unveiled its new lineup of HDV V-plows. Available in either powder-coated mild steel or stainless steel, with blade widths of 8 foot 6 inches or 9 foot 6 inches, the HDV plows boast flared moldboards that are reinforced by two angled power ribs. The tall flared wings throw snow at a high and wide angle to provide exceptional snow-throwing action, while an integrated snow catcher keeps snow from spilling over the top, the company said. The plows have durable double-acting angle cylinders that push and pull the wings forward and back even under the heaviest snow loads. A large, 1.25-inch center pin is positioned to make the plow completely flat when in straight blade mode. A responsive direct lift system includes a massive cylinder that provides a wide range of motion, impressive lifting power and high stacking performance, SnowEx said. Whether the plow is in scoop, angle or straight blade position, an independent trip edge protects the plow, truck and operator when encountering obstacles. Because only the edge trips, users can keep moving without losing a load of snow. The Automatixx power-assisted attachment system includes self-aligning, removable receiver brackets that provide additional ground clearance when setting up. Additionally, Automatixx allows everything to be hooked up from one side of the truck. Users can choose between the Power Grip hand-held control with backlit buttons and a compact joystick control. Both controls feature power “on” and float LED lights and are compatible with SnowEx Fleet Flex technology, an electrical system that provides complete fleet interchangeability between other SnowEx plows. A standard poly cover protects hydraulic components.